Hollington United Football Club’s first team went top of the table after a Jay Tomlin hat-trick helped clinch another win on Saturday. A very good 4-1 victory away to Forest Row put the Lions three points clear of Cuckfield Rangers at the top of the Mid Sussex League Premier Division, albeit having played twice more. Hollington really struggled to get going in the first 45 minutes. The home side dominated possession, but without really threatening the Lions’ goal. Right on half time a Kian Moynes corner was headed back across goal by Alan Foster and young Tomlin headed home to give Hollington the lead against the run of play. With a few choice words at half time, Hollington’s management demanded a massive improvement during the second period. Straight away the players seemed to wake up and created more chances in the first five minutes after the resumption than they had in the entire first half. Moynes headed against the crossbar and Ricky Martin volleyed over in a spell where you could see the Lions taking the game away from the hosts, but it was Forest Row’s turn to score against the run of play to equalise. This could have deflated a lot of teams, but instead it just seemed to spur Hollington on. Dominic Clarke had a goal disallowed for offside even though Hollington were convinced he looked onside, but within minutes Tomlin scored his second after rounding the goalkeeper. 2-1 became 3-1 when a corner was met at the far post by a superb header from Dan Hull. 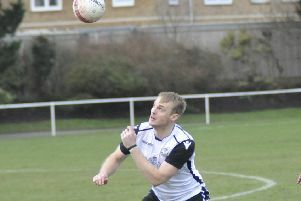 Man of the match Tomlin then completed his treble when he muscled his way past the Forest Row centre-half and finished superbly into the far corner. Hollington manager Scott Price said: “When we played these (Forest Row) at home I thought they were very good, so I knew it was going to be tough. Playing at Oakwood, though, I knew it would suit us with how we play. “But first half we were poor, we put ourselves under a lot of pressure by not keeping the ball and seemed a yard off the pace. To score (the first goal) when we did would have hurt them as we didn’t deserve it at all. “But as poor as we were first half, we were outstanding in the second. Young Jay just gets better and better, also we had Dan Hull and Kian back after a spell with Hastings’ first team, which I think speaks volumes on what we’re achieving here. “Not only competing on all three fronts, we are doing it with 16/17-year-olds and developing them into bigger and better things in the future. Hollington will host AFC Ringmer this coming Saturday. Kick-off at Gibbons Field is 2pm. Mid Sussex League Premier Division top four (played-points): 1 HOLLINGTON UNITED 17-43 (+30 goal difference), 2 Cuckfield Rangers 15-40 (+39), 3 Balcombe 16-39 (+39), 4 Lindfield 16-33 (+35), 5 Forest Row 19-31 (+2).